Yesterday I was looking at the site cameras from work (as you do) and saw movement by the side porch roof. The roofers were back! I went to the house in the dark and yep, roof is starting to go in. I posted a quickie photo on Facebook, but it really did not show very much, so today I went by the house to take more photos. The roof still has a protective plastic coating on it for the construction process. Obviously we won't have little red arrows all over the roof when we are done. 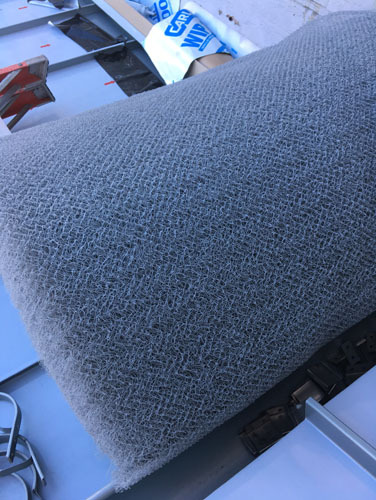 This big roll is a mesh that goes over the roofing underlayment to allow air circulation under the roof. 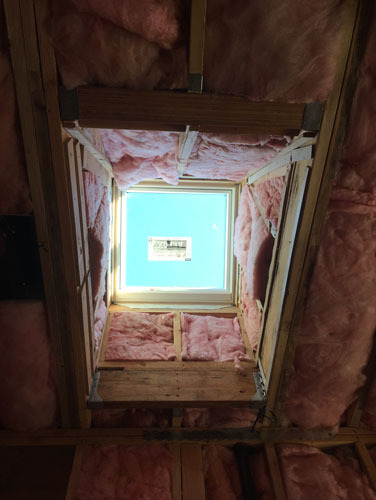 That means that any moisture that gets trapped under the roof won't just sit there, but can evaporate and be carried out of the roof system through this mesh. Also, when I got to the house, there were guys everywhere and insulation was being installed. This is the upstairs hall ceiling. And the skylight in my parents' bathroom. I have done things with fiberglass insulation. I do not envy these guys this. What I didn't take photos of (because I am a sensible person) was the attic insulation going in. The attic ceiling was getting spray foam insulation, and the guys were in the process of spraying it. That's not something you want to be around without wearing protective gear. So maybe photos tomorrow. We are still in discussions with the contractor about insulating the existing house. 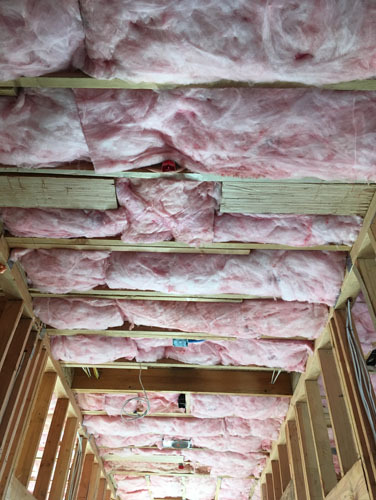 The insulation installers stuffed fiberglass in the various holes, but that doesn't make much sense. 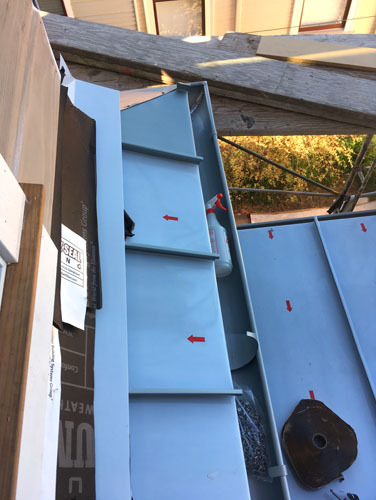 First and most importantly because fiberglass insulation will hold water against the siding, so it doesn't work in our walls which are designed to act as rain screens more than water barriers. 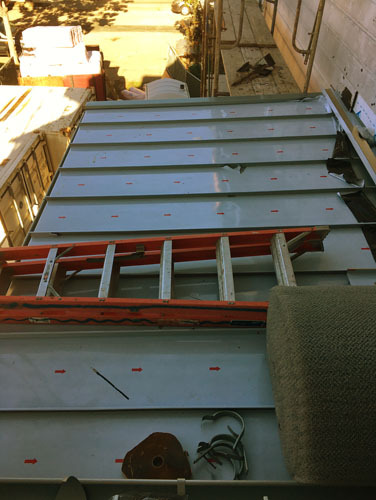 (The new walls act more as modern walls and can be insulated, no problem, but we didn't tear off all the siding on the house so we have to treat the existing walls differently.) Second because a tiny bit of insulation in a massive wall that is otherwise uninsulated is completely useless. So more may happen with this; we will be in more discussions about it in the next day or so.